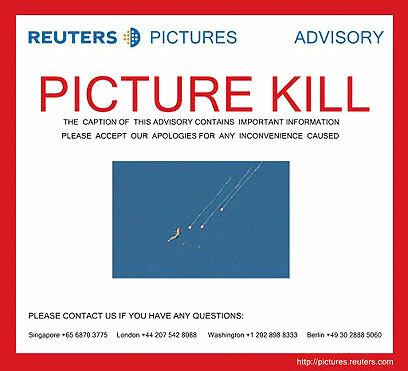 Reuters has withdrawn a second photograph and admitted that the image was doctored, following the emergence of new suspicions against images provided by the news organization. On Sunday, Reuters admitted that one of its photographers, Adnan Hajj, used software to distort an image of smoke billowing from buildings in Beirut in order to create the effect of more smoke and damage. The latest image to face doubts is a photograph of an Israeli F-16 fighter jet over the skies of Lebanon, seen in the image firing off "missiles during an air strike on Nabatiyeh," according to the image's accompanying text provided by Reuters. The owner of the My Pet Jawa web log noted that the warplane in the picture is actually firing defensive flares aimed at dealing with anti-aircraft missiles. In addition, the Jawa blog says the flares have been replicated by Reuters, giving the impression that the jet was firing many "missiles," thereby distortion the image. 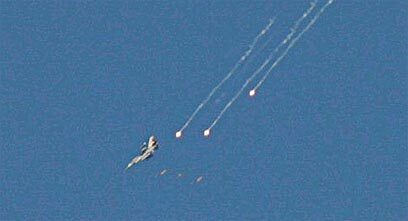 "The F-16 in the photo is not firing missiles, but is rather dropping chaffe or flares designed to be a decoy for surface to air missiles. However, a close up (of) what Hajj calls "missiles" reveals that only one flare has been dropped. The other two "flares" are simply copies of the original," Shackleford wrote. "But what about the 'bombs' in the photo? Here is a close up of them. Notice anything? That's right. The top and bottom "bomb" are the same." Following the accusations, Reuters conceded that a second image it provided had been manipulated, and released a statement saying it had recalled all photos by Hajj. "Reuters has withdrawn from its database all photographs taken by Beirut-based freelance Adnan Hajj after establishing that he had altered two images since the start of the conflict between Israel and the Lebanese Hizbullah group," the statement said. The news outlet said that it discovered "in the last 24 hours that he (Hajj) altered two photographs since the beginning of the conflict between Israel and the Lebanese group Hizbullah," Reuters added. “There is no graver breach of Reuters standards for our photographers than the deliberate manipulation of an image", Reuters' statement quoted Tom Szlukovenyi, Reuters Global Picture Editor, as saying. Reuters also said it would apply "tighter editing procedure for images of the Middle East conflict to ensure that no photograph from the region would be transmitted to subscribers without review by the most senior editor on the Reuters Global Pictures Desk." "Reuters terminated its relationship with Hajj on Sunday... An immediate enquiry began into Hajj’s other work," the statement said. Hajj had provided Reuters with several images from the Lebanese village of Qana, many of which have also been suspected of being staged. 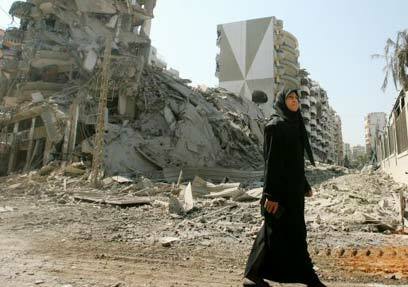 Other Reuters images have been called into question by blogs in the United States. A reader of the Power Line blog, Robert Opalecky, wrote: "I don't know if this has been brought to anyone's attention yet, but in a quick search of the authenticated Reuters photographs attributed to Adnan Hajj, I found the following two." "One is from July 24 of a bombed out area in Beirut, with a clearly identifiable building in a prominent part of the shot. 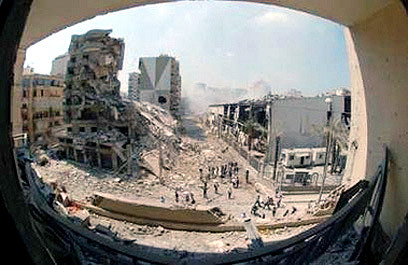 The second is of the exact same area, same buildings, same condition, with a woman walking past "a building flattened during an overnight Israeli air raid on Beirut's suburbs August 5, 2006," he wrote. A film released on the YouTube video sharing website compares the two images, and appears to show striking similarities between the photograph used by Reuters on both July 24 and August 5. See all talkbacks "Reuters admits to more image manipulation"